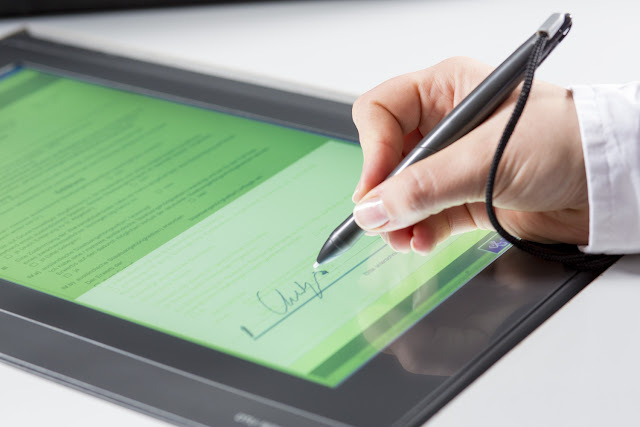 Finahub Official Blog: How Electronic Signatures helps hospitality industry to improve their services? How Electronic Signatures helps hospitality industry to improve their services? Improving the customer experience is becoming worldwide, and the main example in this movement is the hospitality industry. Many organizations in this industry tend to adopt digital technologies for customer support. The varying demands and eccentricity of guests, keeping the expenses under control and successfully handling all other responsibilities can be overwhelming, even for the most experienced managers. Actually, it takes much more than an average manager to bring order in the demanding and chaotic world of hospitality. The competition in the world of hospitality has been ever-ripe. Obviously, in the attempt to beat the competition, players in the industry leave no stone unturned. This is a major challenge in itself. They are always striving to improve and grow. And remember, the primary focus on their attempts revolves around enhancing the customer experience. In other industries like banking, automotive, and pharmaceutical, the product is usually the primary determinant of success, and client experience comes secondary. As you might be aware, the hospitality industry is very different. Customer experience is a key ingredient of the delivered product. Chaos and mismanagement are evident in the world of hospitality, just because of the nature of the services involved. Poor workflow, too much paperwork, and decentralized system lead to loss and mishandling of information. Improving workflow can boost efficiency and allow players in the hospitality industry stay competitive. Some of the typical paperwork synonymous with the hospitality industry includes guest check-in and check-out forms, employee records, operating sheets, supplier invoices, sales reports, and cash receipts. These documents are manually signed, scanned and emailed, sent via courier, or faxed to relevant parties for approval and retention purposes. This is so time-consuming and inconveniencing, right? Your customers don’t wish to be kept from their rest time by mind-numbing paperwork. The solution to all these setbacks lies in incorporating a simple system that is inexpensive, simplifies workflow, provides cost savings and brings order in chaos. Apparently, an electronic signature solution does all that. Presently, hotels and other hospitality facilities are offering the efficiency of check-ins to clients through online portals. Customers don’t have to be physically present. This is logical and convenient for traveling business-people who wish to book a hotel at the last minute. Easily, they can perform all the procedures of checking-in by accessing forms via the online portal. They can choose an online payment option and remotely e-sign documents or check-in forms for further processing. Many hotels are also embracing the process of online reservation. Customers can reserve a table online, pay for the services, and e-sign the request form to confirm the reservation. Players in the hospitality sector are offering advanced solutions for customers who wish to get additional services throughout their stay. It could be excursion services, dry cleaning services, car rental services, etc. The hassle of completing and manually signing facilitation documents for these services is minimized. Thus the whole process becomes automated with an e-sign integrated online system. The invoicing operations in the world of hospitality have also incorporated e-signature solutions. Companies nowadays don’t have to wait for the invoice or proof of purchase to be manually sent to them. Actually, the invoice can be uploaded to their account directly or sent to them through emails, where conveniently they can review and electronically sign it as a way of consenting, particularly during the check-out period. 1. Improved brand image – Young people are becoming the dominant customers for the hospitality industry. They have an inborn preference for technological solutions and organizations that use e-signatures, appeal to young consumers more than organizations which provide services in the traditional way. 2. Improved customer service - Now the services become quick and transaction process becomes semi-automated. They can spend more time in discovering the needs and preferences of their clients, which otherwise is not doable among the procedures involved in processing the documents manually. 3. Reduced overhead costs – By going paperless, the players in the hospitality world can cut the overhead cost. Money could alternately have been used in servicing photocopying/scanning machines or buying things like toner and paper can be used for other important things. 4.Centralized repository – With an electronic signature solution, managers can create, save, and import all types of forms and securely store them in a centralized location. You do not have to look for information in different locations. As a manager, you will be rest assured; all your vital documents are secure and easily accessible via the electronic signature software. You can also keep records for future reference and for the purposes of regulatory compliance, without occupying extra office space. Simplifies workflow and improves collaboration. Reduces confusion that comes from too much use of paper. Improve information availability by electronically maintaining all documents. Doesn’t require strong technical skills. Customers come first in the hospitality industry. However, for too many hospitality businesses, paperwork gets in the way resulting in the poor customer experience. A document delay keeps your customers from entertainment which is the very key reason they are visiting your premises. This can be reduced by having an e-sign solution in place.